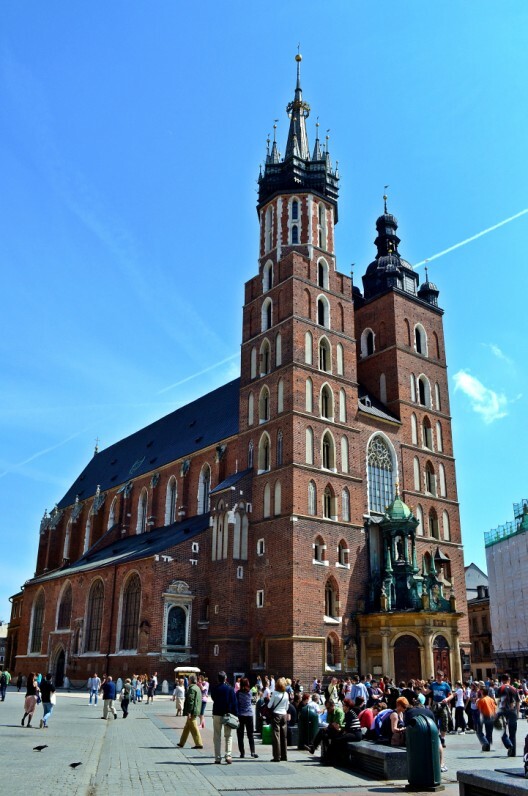 The towering edifice of St. Mary’s Cathedral dominates the northeastern corner of Rynek Glowny, the vast open square of Old Town Krakow. Although the cathedral’s full name is the Church of Our Lady Assumed into Heaven, it’s safe to say not many people bother with that mouthful. Call it St. Mary’s and you’ll be fine. To say you couldn’t miss it would be vastly overstating the obvious. At 80 meters tall (262 feet) there’s nothing else in the vicinity that comes close. 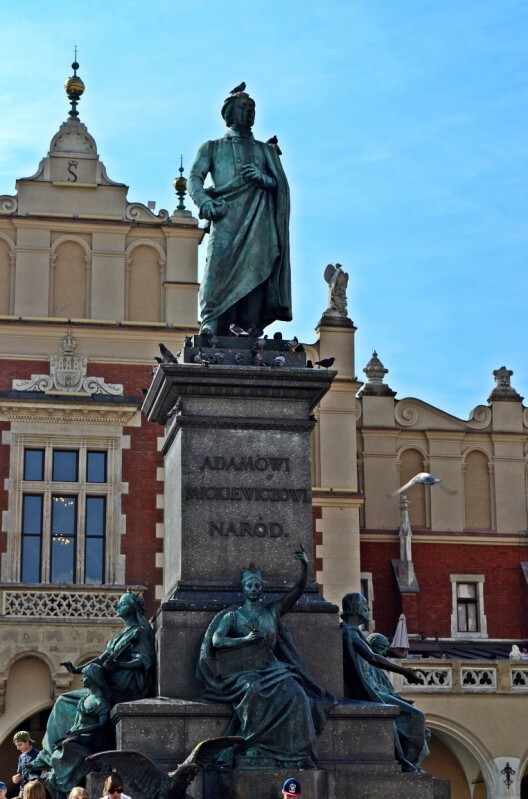 St. Mary’s has been around a long time, like most everything in this part of Krakow. Originally built in the early 13th century, it was rebuilt in brick Gothic style in the 14th and completed in 1347 under the reign of Casimir III, the Great. 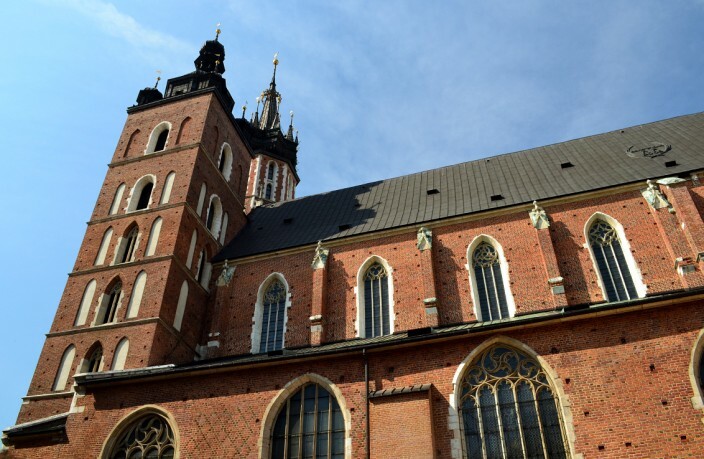 Every hour, on the hour, a trumpeter plays a tune called the hejnal mariacki from the taller of St. Mary’s two towers. It’s a plaintive melody and stops abruptly midstream, in commemoration of the bugler who was killed by Mongols as he warned the city of their attack. Standing below and hearing this tune roll out across the square is a special treat that will send chills down your spine. 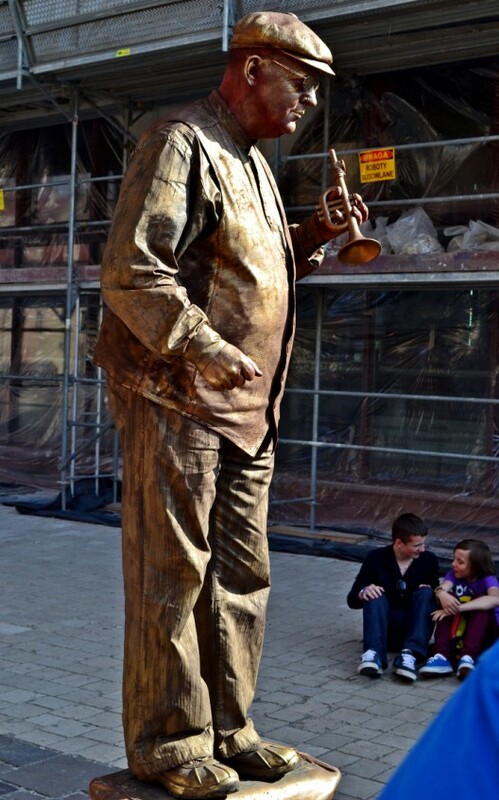 No matter where you are in the square or what you’re doing or how noisy it is, the sound of that lone trumpet cuts through and floats above everything else and commands your attention. Outside the cathedral there are lots of things to see and do, one of the most popular being the various “statue people” i.e. 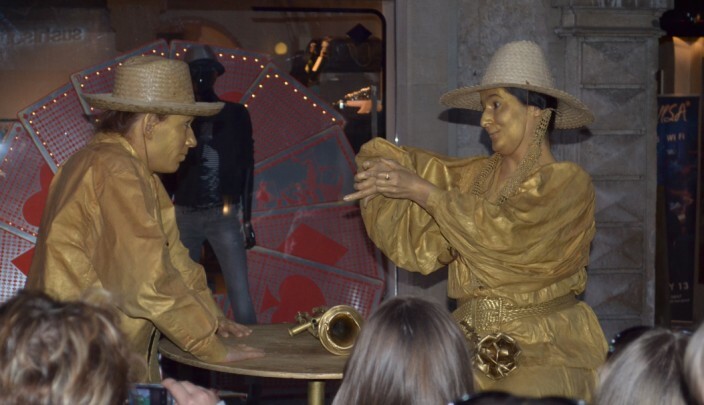 folks who don special garb and body paint (usually gold or silver) and stand frozen in place on a box or pedestal while passersby take photos of them and toss coins in a hat for their “performance”. Some folks like to watch them endlessly. For me, a few minutes is enough. But the real attraction of St. Mary’s is inside. 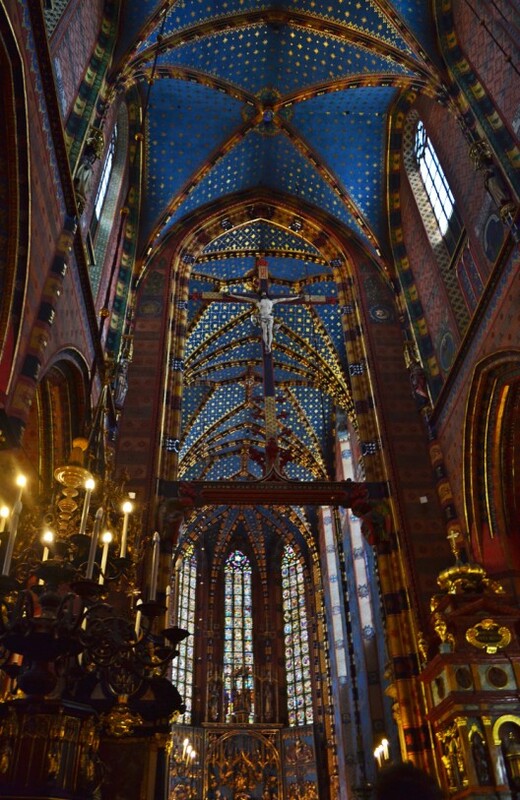 Step in from the sunshine, as we did, take a couple of minutes for your eyes to adjust to the darker interior and then let them feast on the most splendid, ornately decorated cathedral interior I’ve ever had the pleasure of witnessing. Words truly cannot do justice to this place, no matter how many descriptions I might attempt. Every square inch of it is painted, carved, frescoed, tiled, draped or otherwise covered in the most fabulous and colorful decorations imaginable. We wandered around and around, mouths agape, rapt with wonder at the spectacle. It’s almost overkill, too much to take in all at once. 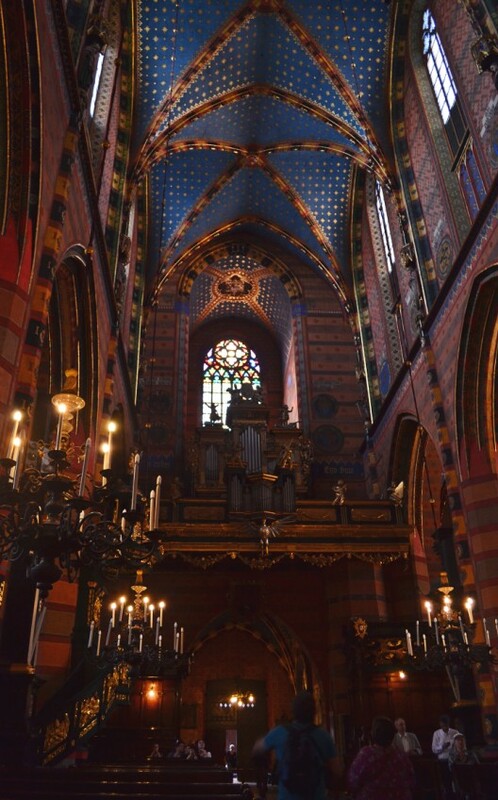 The most famous piece inside is the main altar, carved from wood by a man named Veit Stoss. 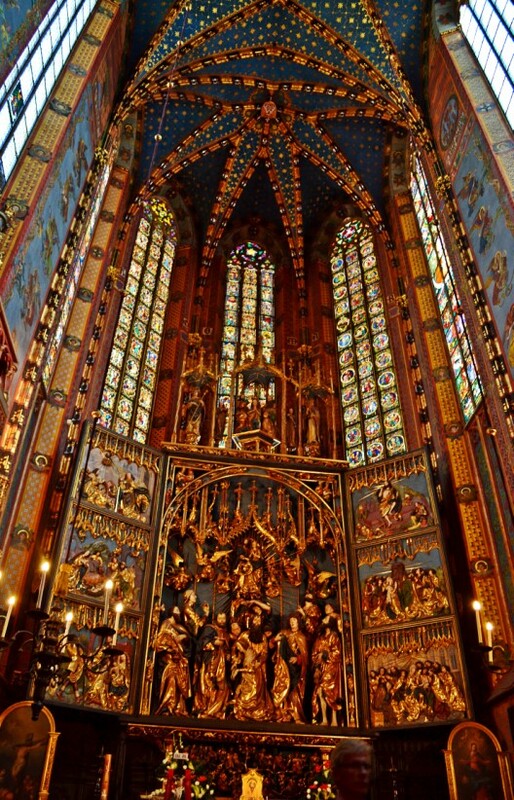 This altar alone would be worth going in to see. In fact they make a big deal out of it every morning when it is opened up in an “unveiling” ceremony (it’s built in a hinged three-panel design that can be closed). But you have to get there early as the sanctuary fills up for this opening. 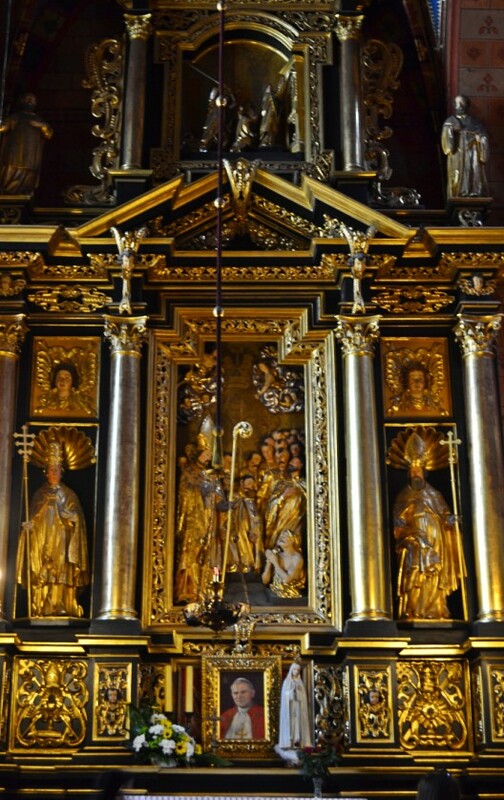 When the altar is closed, it has panels depicting 12 scenes from the life of Mary. 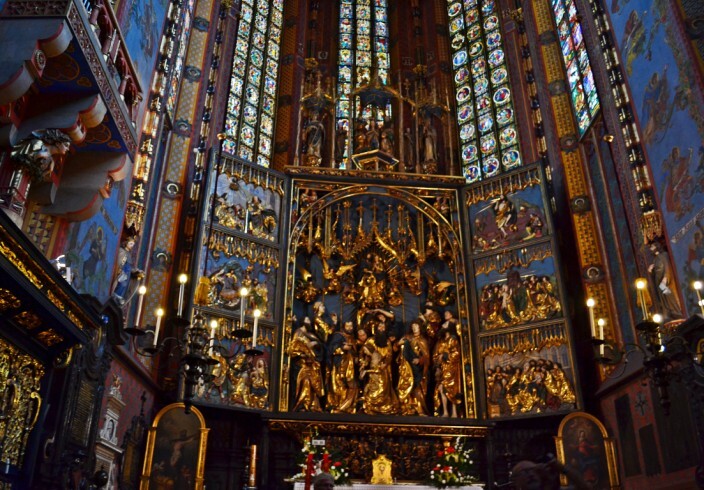 The altarpiece is done in a triptych, or three panel design. 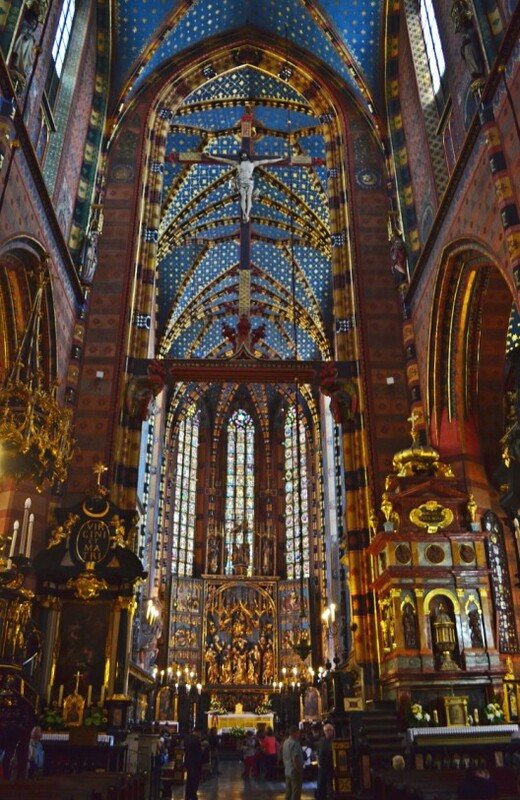 It is in fact the largest Gothic altarpiece in the world, at 13 meters high and 11 meters wide when fully extended. That’s about 40 feet by 34. It’s covered in richly detailed figures carved from oak and linden wood, depicting various biblical characters and events, naturally. 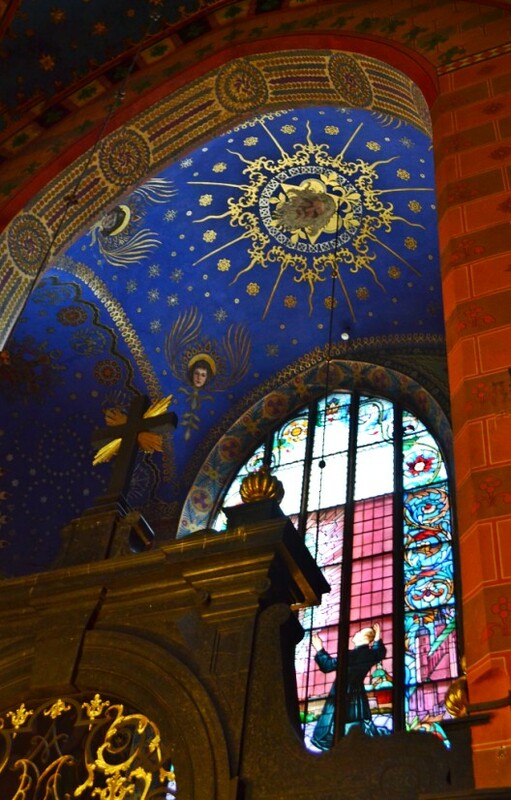 At the bottom is the death of Mary surrounded by the twelve apostles, and above that is the Assumption of the Madonna, which makes sense in a church named for that event. The side panels depict various events from Mary’s life, mostly with Jesus, such as the Nativity, Crucifixion, and Resurrection. 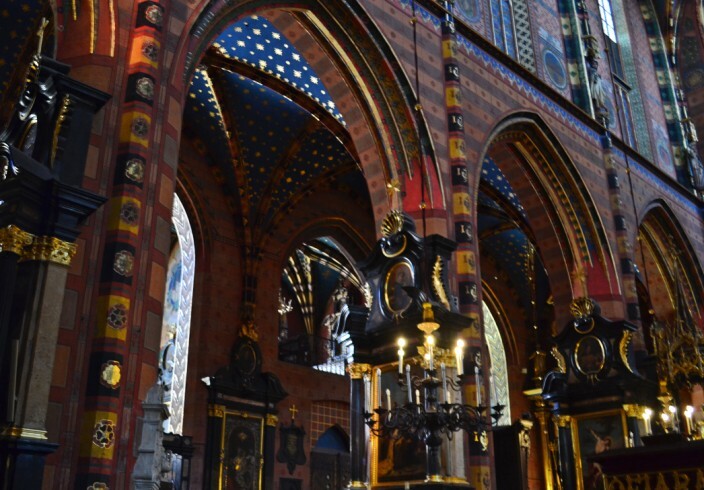 While the Veit Stoss altar is impressive, so is everything else inside. 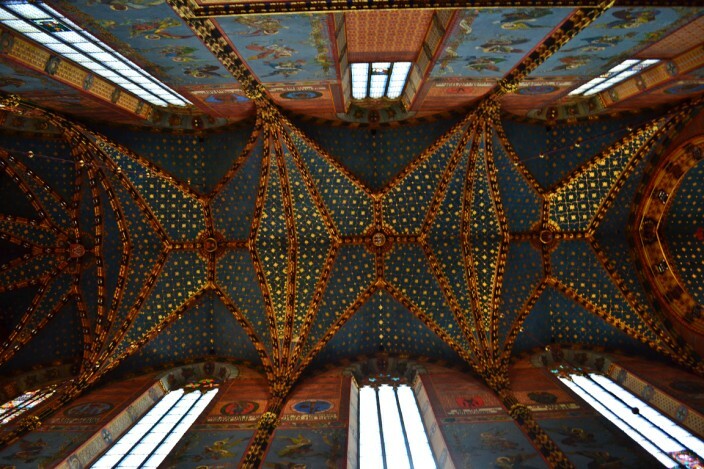 My own personal favorite is the ceiling, a deep velvety midnight blue littered with gold stars. We circuited the place twice, sat for a time, then walked around some more. I could have stayed longer, honestly, but there are other things to see and do outside, too. 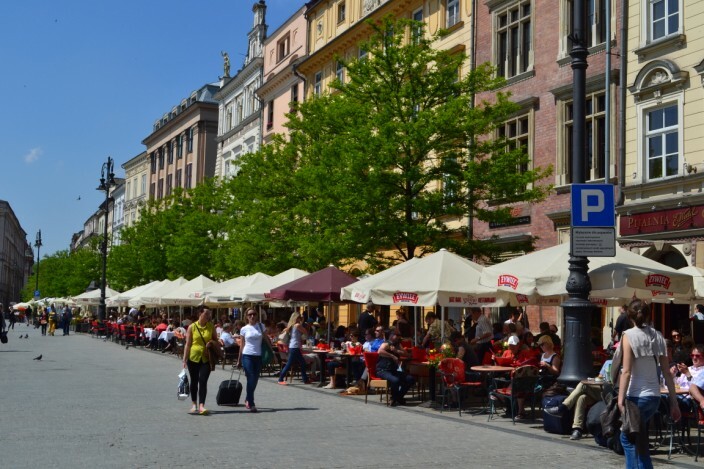 Besides the aforementioned statue people, there are scores of cafes and restaurants to choose from ringing the Rynek Glowny, and on a sunny afternoon or evening most of them are filled with locals and tourists alike enjoying lunch or dinner, a coffee or beer. You can watch the horse-drawn carriages roll by, or hire one for a one hour excursion that takes you all the way around Old Town. 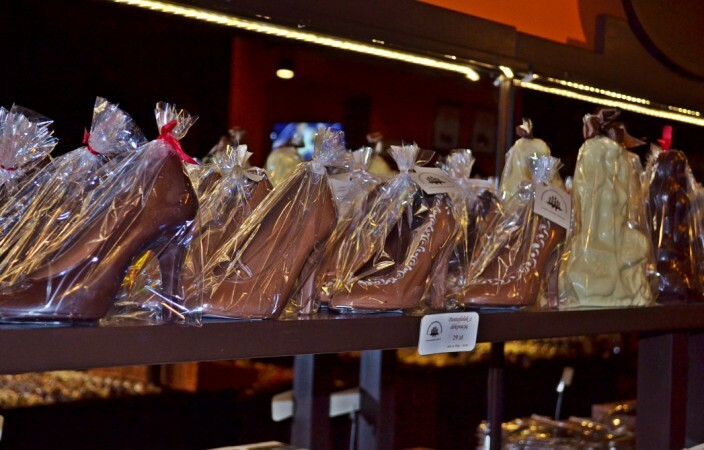 We found a great chocolate shop, where you can watch them making handmade chocolates in the form of shoes, violins, soccer balls, all manner of animal shapes, or just about anything else you could imagine. 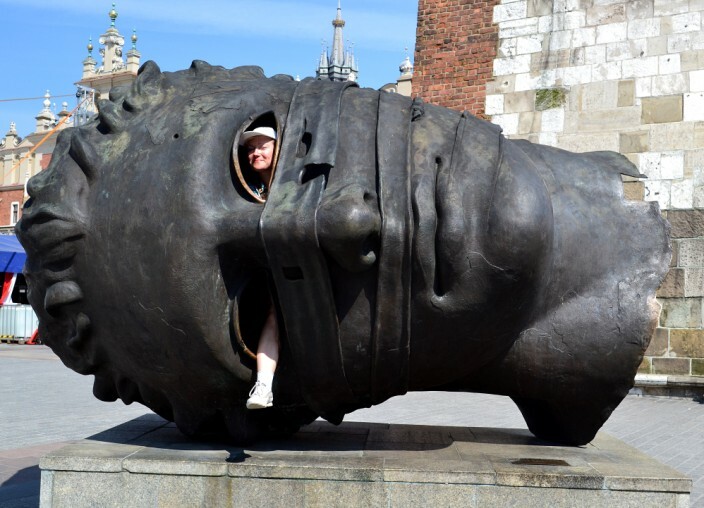 As I’ve mentioned in a previous article, don’t miss the Rynek Underground (though that’s better saved for a rainy day) beneath the Sukiennice in the center of the square. But the best thing about the place is simply hanging out, milling around, people watching, picture taking, or whatever suits your style. 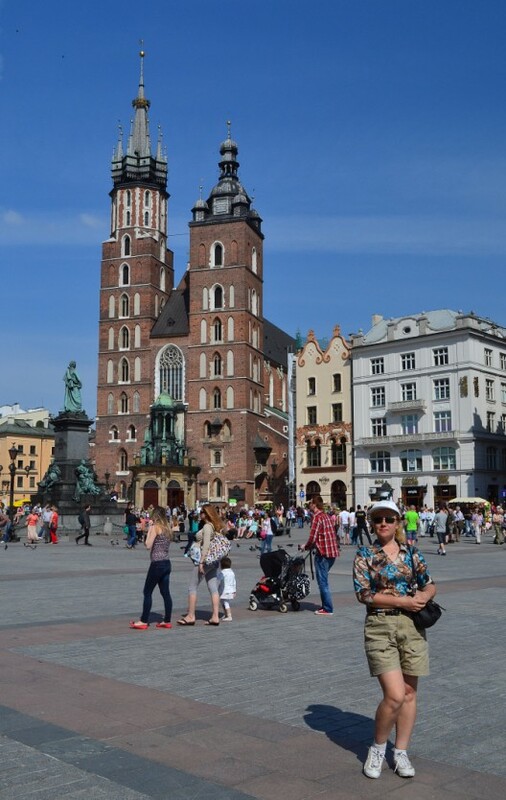 Rynek Glowny is the largest medieval town square in all of Europe, and has been the social and cultural center of Krakow for centuries. Come check it out for yourself and you’ll see that it still is.